Collaboration is key to our activities. We work together with myriads of sectors to create innovative projects. Since 2001, the following companies have kindly sponsored our activities. With these business partners, we have co-developed products and services that embody Think the Earth's theme. Seiko Instruments Inc. / Helped us launch our inaugural project. By giving people a daily reminder of what the Earth looks like from space, the same sight astronauts see, we encouraged people to think globally, to think about the global environment and peace. 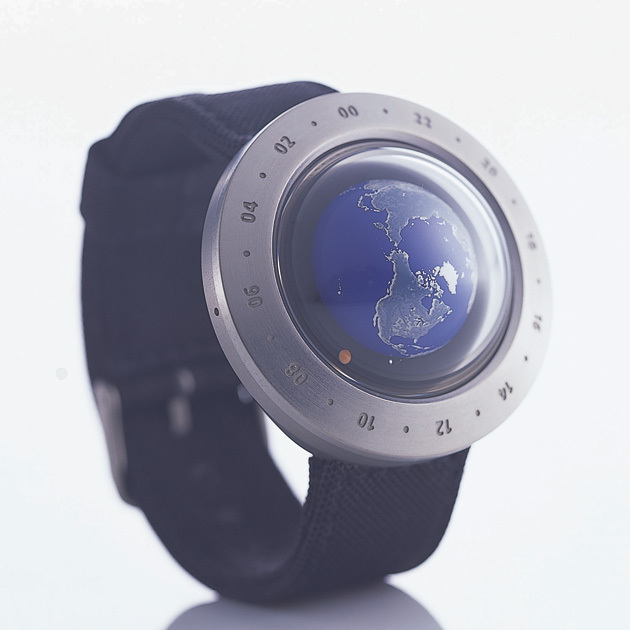 Empathizing with the product's concept, Seiko Instruments designed and manufactured this watch. 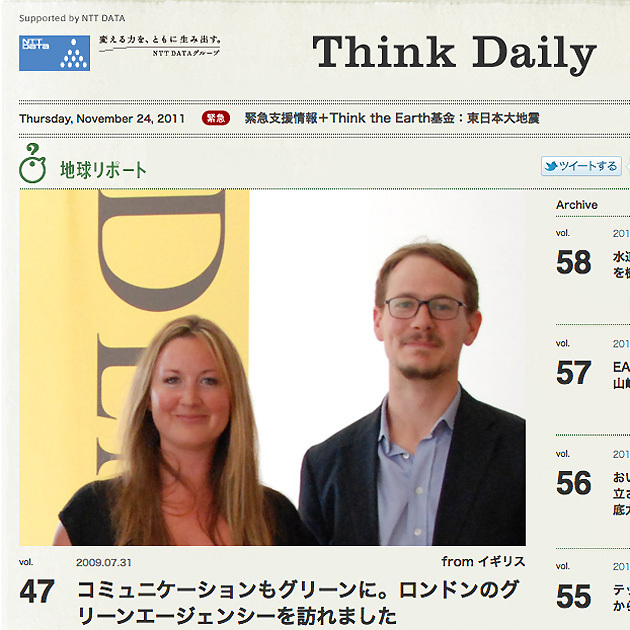 NTT DATA Corporation / Has been supporting the web media for global citizens, "Think Daily," which launched in 2000. 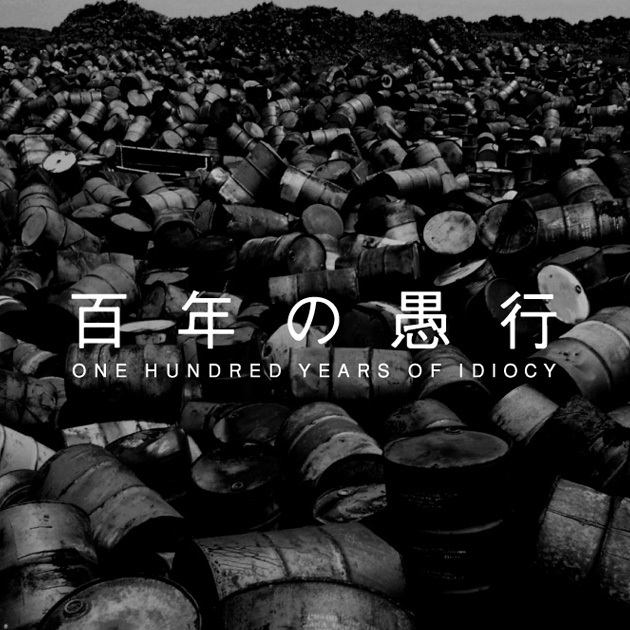 Ricoh Co., Ltd., amana inc., KINOKUNIYA COMPANY LTD. / These companies have sponsored and assisted this project, which introduces the idiocies of mankind during the 20th century through 100 photographs. 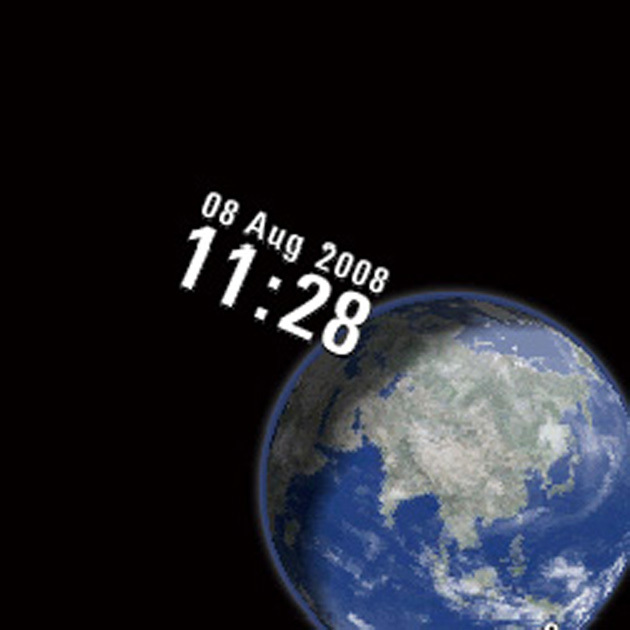 Mobile Phone App - "live earth"
KDDI CORPORATION, SKY Perfect Broadcasting Corporation (e-tenki.net), Japan Weather Association / A mobile phone app that shows "real-time, live images of the Earth." A portion of the proceeds was donated to the disaster relief, emergency assistance fund. 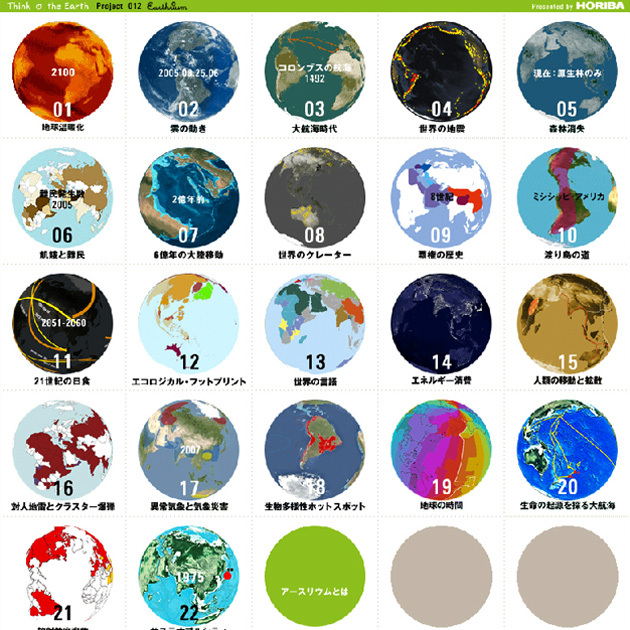 HORIBA, Ltd. / Helped developed the digital globe content available on the web that gives visitors different views of the Earth from space generated by topic such as culture, history, and science. 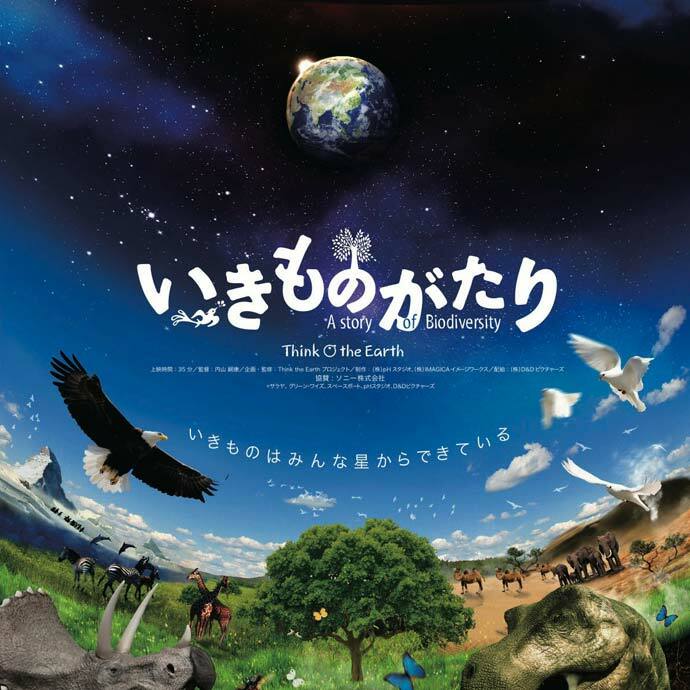 Digital Planetarium Visual Content - "Stories of Biodiversity," "Stories of Water"
Sony Corporation, Saraya Co., Ltd., GREEN WISE Co., Ltd., Digital and Design Pictures / Produced the digital planetarium visual content featuring "Stories of Biodiversity" and "Stories of Food" as seen from space in time for the 10th meeting of the Conference of the Parties (COP 10) held in Nagoya in 2010.
assiston ／ AXIS lnc. ／ KARHU INC. ／ Naturum Corporation ／ SCALE Inc ／ Sound Bum ／ SPACEPORT Inc. ／ J.Osawa Group Co., Ltd.
Graduate School of Media Design, Keio University ／ Graduate School of System Design and Management, Keio University ／ Japan Aerospace Exploration Agency ／ Japan Agency for Marine-Earth Science and Technology ／ National Institute for Environmental Studies etc. AMDA ／ CARE International Japan ／ Japan Platform ／ Shapla Neer ／ Japan Committee, Vaccines for the World’s Children ／ Save the Children Japan ／ Peace Winds Japan ／ Tsurumi River Basin Networking ／ Iwate Ryuiki Networking etc. copyright 2000-2019 Think the Earth & SPACEPORT Inc. All rights reserved.